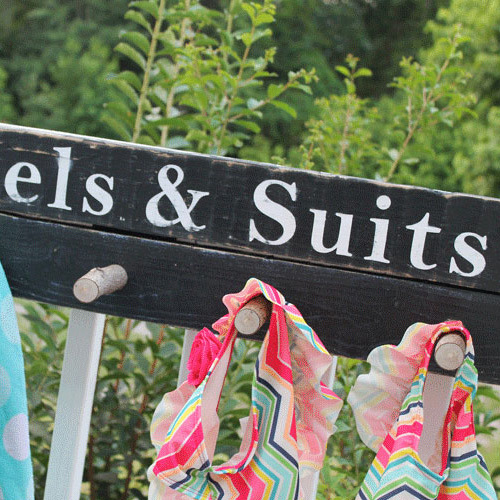 Need a way to dry your bathing suits and beach towels outside? 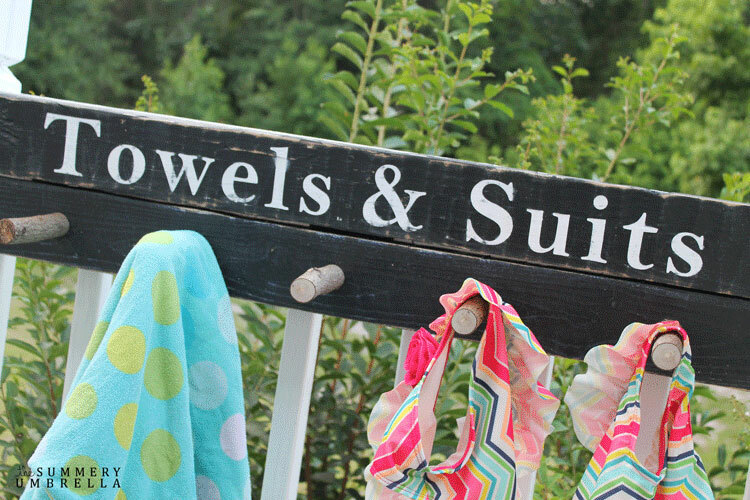 Make this DIY beach towel and bathing suite rack! It’s easy and you can customize it. 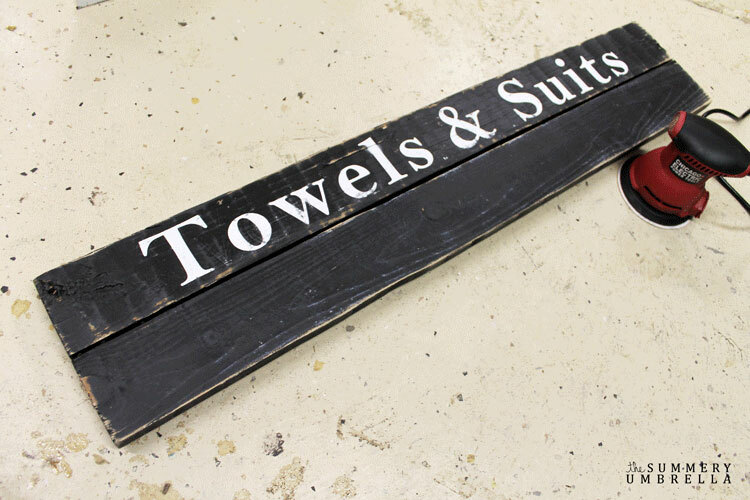 Sick and tired of wet suits and towels laying on the floor? 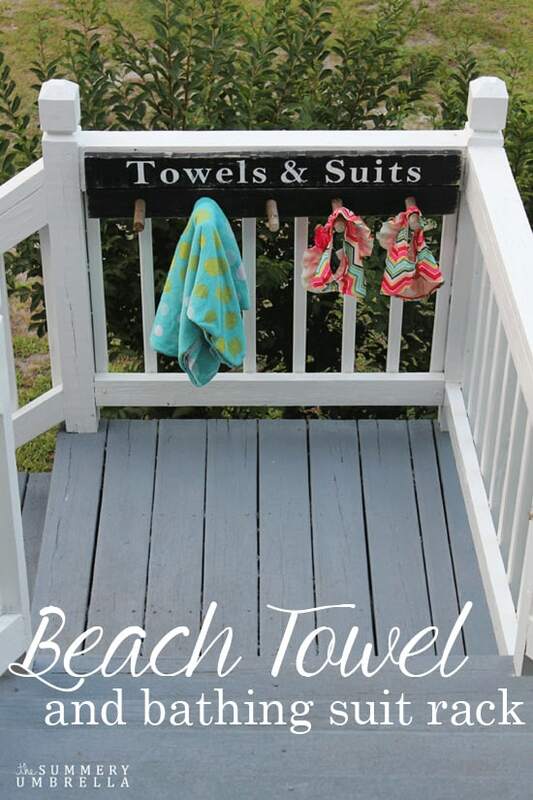 Create this perfect little beach towel and bathing suit rack that help eliminate this problem! Today I have an absolutely useful sign turned hanger that you’ll probably be using all season long. I’m not sure about you, but in my household one of us always has wet clothes, bathing suits, towels and other random items that usually (let’s be honest!) end up on the floor of the porch. I’ve tried encouraging my follow roommates (aka. the daughter and the husband) that there are better locations for these items. However, here I am picking them up yet again! Anybody else have this problem? Well, let me help you out and lets get started! 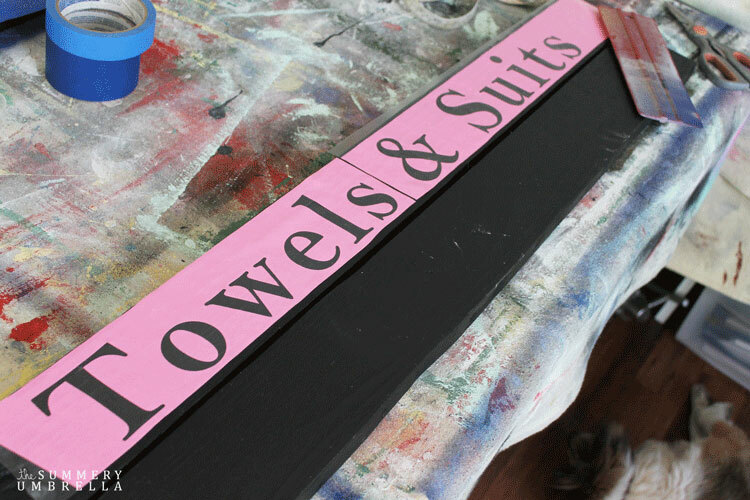 This tutorial will walk you through every step so you can make your own wood sign and bathing suit storage solution. Follow these easy steps and you’ll have your own sign in no time at all. 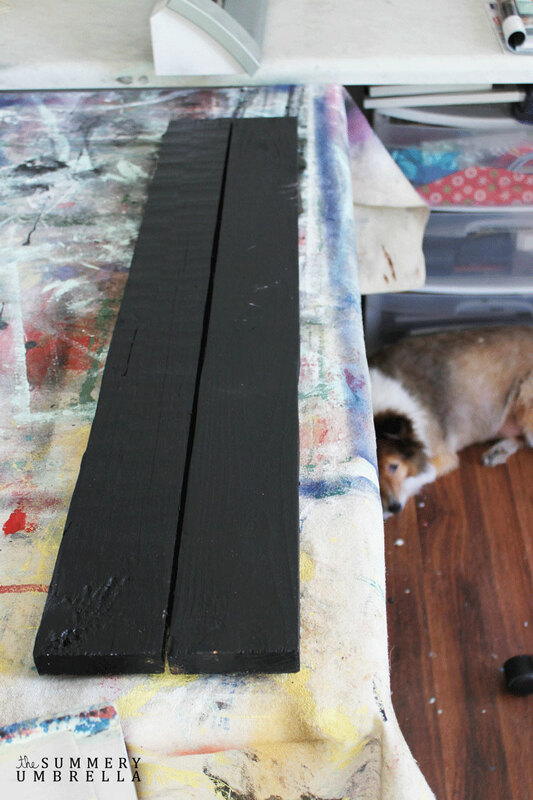 First things first, paint your pallet board. Create any size you would like! One board, two, three… four fish… wait. No fish! You can also do this in a variety of ways. I use my Silhouette Cameo like it’s going out of style, but you can easily do this by using your own handwriting as a font, or even with a pre-made stencil you can buy at the store. Whatever floats your boat! NOTE: Need more in-depth instructions on how to do the above steps? Check out this video tutorial! 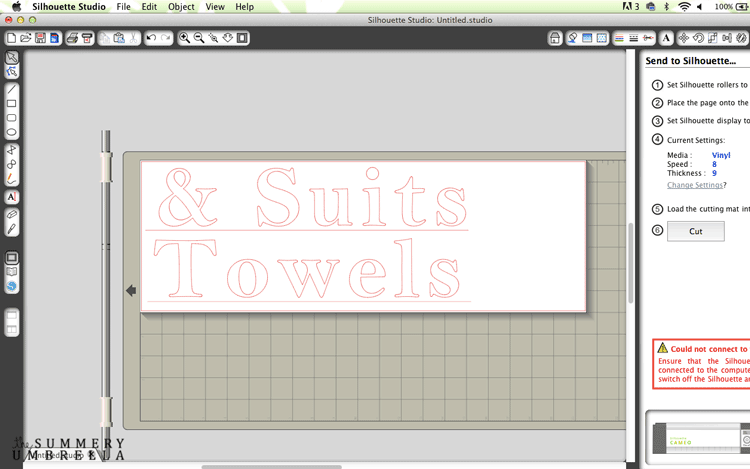 After you’ve created your sign go ahead and tape it down (or whatever your preferred method may be!). Since I used my Cameo for this project I am using vinyl and transfer paper to allow it to stick to my sign while I paint it up. What’s my favorite spray paint to use for signs? Liquitex Professional Spray Paint. Why? 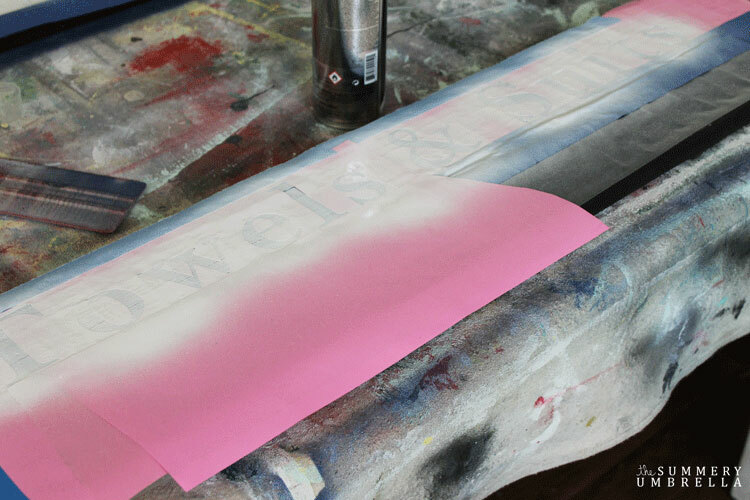 Because it’s created for exterior use (think graffiti artists), and it has low fumes so I can use it indoors. I cannot speak highly enough about this brand! Remember: light, multiple coats are best! Remove all of your vinyl, and voila! Your sign is gorgeous! 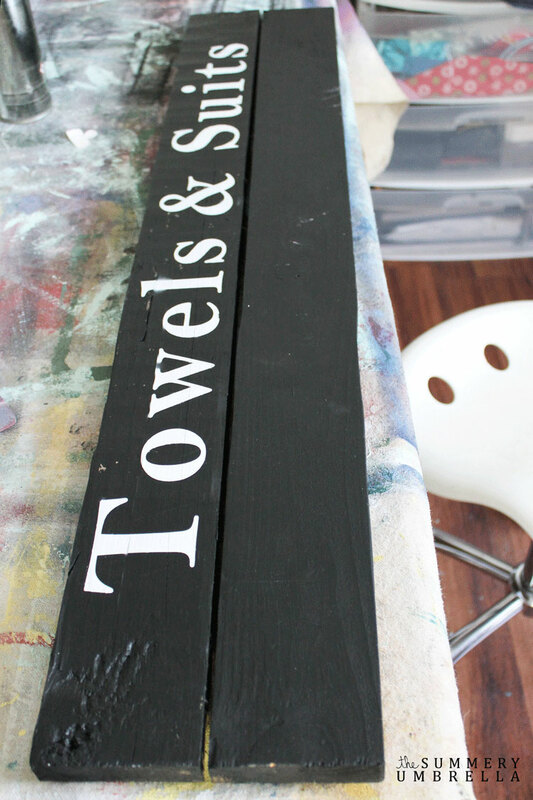 I absolutely love all my signs with a distressed finish! You can skip this step if you’re not a fan though. 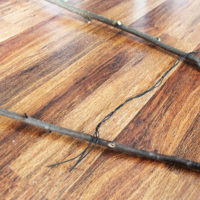 Then, cut as many branch “hangers” as you would like. Five was just enough for me, but whatever you’d prefer is also just fine! 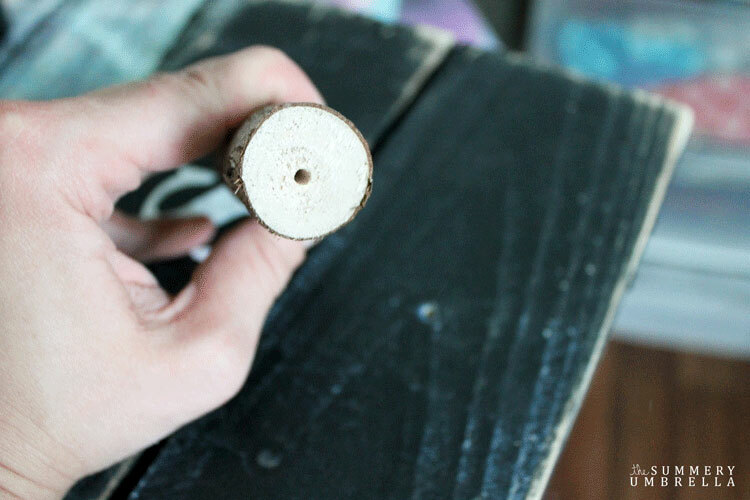 Next, drill holes in all of your branch pieces as well as where they will be located on your sign. It’ll just make screwing them in a hundred times easier. Finally, add hangers to the back and hang it up!! 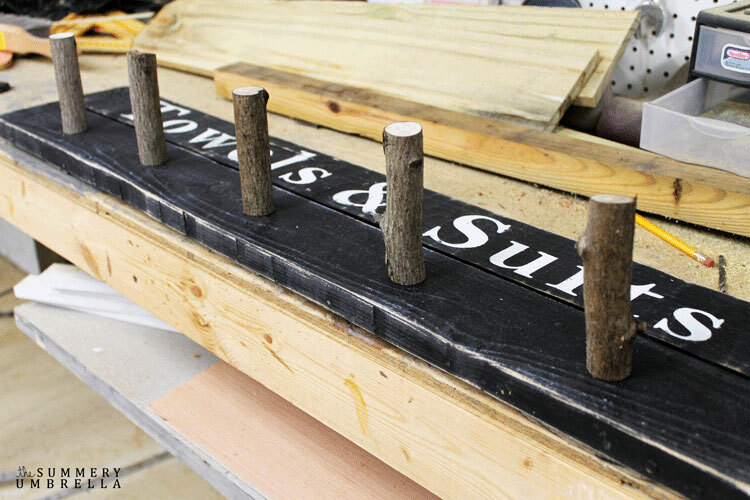 Looking for more DIY Sign Tutorials? Thank you for having me, Cathy! Such a great party! Love, Love, Love! Those hangers (branches!) are awesome! I need to make me one of these! My kiddios are always just throwing their wet suites where ever! This is perfect! Thank you so much the inspiration! Dropping in from Brag about It, so glad I click on your link! This is absolutely adorable! Gives me a great idea for my beach place. Too too cute! I love everything about it – the fact it’s DIY and that all the materials are low cost, that you have it hanging up outside, that it’s usefuly, and of course, that it looks great! What a great idea! I love using my silhouette for projects. Thank you so much for sharing on our Living with Style Linky Party. Please come back next Wednesday! Lz, you’ve got to quit making such cute stuff- my “I’m gonna make this” list is getting longer and longer! 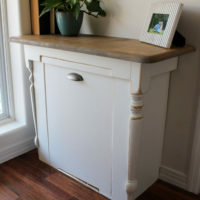 :) I love this so much it’s one of my features at Treasure Box Tuesday this week! We get started tomorrow evening (Monday, 7/20)! :) Thanks for linking up with us! LOL. You’re killing me Joy :) Thank you so very much for the feature and the wonderful party. Always a pleasure! This is so cute. We’ve just been draping stuff over the rail but this is much prettier. Thanks for posting. Hello from Treasure Box Tuesday. Hi Melissa and thank you so much :) P.S. I’m loving your More for Less Meal Plan for July!! Super cute. How did you attach it to the railing?